Susanne Kamerling is Researcher and Lecturer at the International Relations and International Organization Department of the University of Groningen and Member of the Centre of East Asia Studies Groningen (CEASG) at the same university. 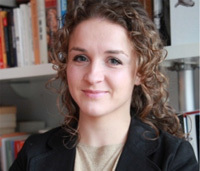 Also, she is an Associate Training and Research Fellow at the Netherlands Institute of International Relations ‘Clingendael’. Her PhD project focuses on the role conception and role performance of China and India in international security issues since the end of the Cold War. As part of this research she was Visiting Fellow at Tsinghua University in Beijing, China in 2015. At IDSA she is currently engaged in research on China’s changing security conception and views on security governance. Next to that, she is conducting interviews within the Indian strategic community in the context of her PhD project. Her broader research is focussed on China’s foreign and security policy, Indian foreign and security policy, maritime security and EU-Asia relations. She has published over 30 articles, policy briefs and book chapters published by Journal of Current China Affairs, Routledge, Brill Publishers, Amsterdam University Press and Clingendael amongst others. She holds an M.Sc in Social Geography/ International Development Studies of the International School of Humanities and Social Sciences (ISHSS) and a M.Sc. in Political Science/ International Relations of the University of Amsterdam, the Netherlands.